Webster defines kvetching as continuously complaining. Wikipedia defines it as needlessly whining or complaining. I would dare say that kvetching could loosely be translated into bitching. It’s time to stop kvetching about the work it will take to get into shape. 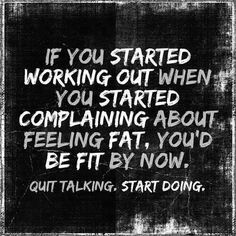 It’s time to stop complaining about how you look and feel. It’s time to stop bitching about giving up the foods that are making you gain weight. It’s time to do something. Kvetching, complaining, and bitching not only make us feel worse about ourselves but it wears on those who love us. For a moment, I want you to imagine how you would feel if you heard someone talking about your daughter or best friend like you talk to and about yourself. Would you be willing to stand there and listen? Not me! I’d be spittin’ and fighting’ mad! And I definitely would not hold my tongue!!!! Yet, we spend hours kvetching, complaining, and bitching about ourselves while the Holy Spirit, our spouse, our daughters, and our best friends listen. And those around us are afraid to say anything at all because they know that we will respond in anger and frustration. I truly believe that as you and I get into the best shape of our lives that we will shine like stars because not only will we look good but we will be pleasant to be around! 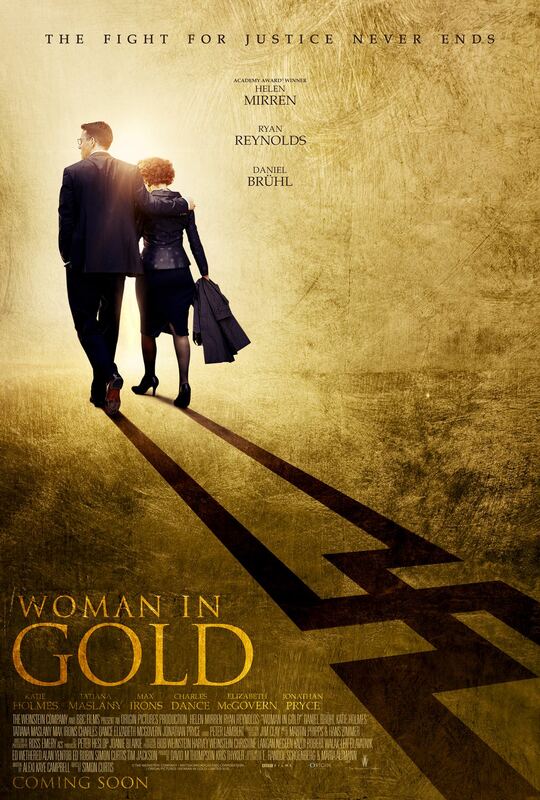 Hank and I went to see Woman in Gold starring Helen Mirren and Ryan Reynolds yesterday. As always, the movies that are based on true stories are the best and this was no exception. I’ve seen several movies about the lives that Hitler took. I’ve read about those who escaped before being sent to concentration camps. And I’ve heard about stolen works of art and/or destroyed by Hitler’s army. But the movie yesterday caused me to think about another aspect of that horrendous war and that is the musical instruments that were destroyed and/or stolen. While Hitler may have focused on the Jews, it seems that Satan has the resources to focus on each and every one of us. It is his ultimate goal to destroy us. And if he can’t destroy us then he is more than willing to steal our passion. Webster defines passion as a strong feeling of enthusiasm or excitement for something or about doing something. But what about you? What are you passionate about? What do you read about? What do you browse on pinterest? What is it that you dream about? If you could put your life on pause and do anything you wanted to do, what would it be? And, let me ask you another question? Are you physically strong enough to do it? Are you healthy enough to go where you want to go? Is it possible that your lack of strength and excess weight would get in the way of fulfilling your passion? Maybe a better question is this: Are you using your weight as an excuse for not pursuing your passions in life? I’m thinking that life in its fullest measure is a life that lived in relationship with God the Father, good health, and filled with passion. I’m just sayin………..
Hank and I got married. And during those 29 years, I’ve had a miracle baby, suffered though miscarriages, had two cancer scares, been hit with a tire iron, was diagnosed with hypothyroidism, dealt with depression, gone through menopause, and crashed my bike. This body has been though a heck of a lot! And this morning, Hank told me that after 29 years of marriage, he still thinks I’m hot! He went on to say that he believed that my body is better than it’s ever been. Throughout the years I’ve gone through cycles of weight gain and loss. I’ve had times where I worked out regularly and times where workouts were shelved while I tried to adjust to the changes that life has thrown at me. I’ve also had times of eating really well —- and those times where I fed my heartaches and depression comfort foods rather than fueling my body. But you know what? Now, 29 years later, I weigh about the same as I did then. I am still wearing my original wedding band. But there’s more to this story. I’m physically stronger than I’ve ever been. I’m more comfortable in my own skin than I ever thought possible. I’ve learned to love the body that I live in while working hard to make it stronger. I’ve learned that health and well-being should be my focus and that the look that I want will be an added benefit. 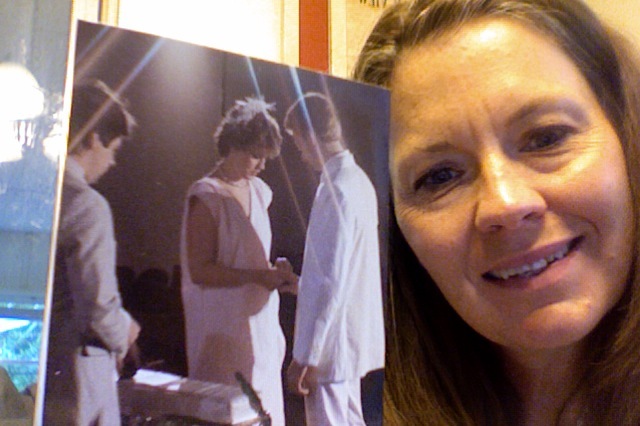 29 years later…. I’m a better me! And that better me is a better wife than I’ve ever been which gives me the best marriage yet! During my last few posts, I’ve talked about some of my struggles with depression. I may have left you with the impression that my depression was cured with diet and exercise alone. But that’s not the truth. From my perspective, depression is more than am inherited chemical imbalance or the hormonal changes that accompany menopause. At it’s core it is a soul issue. My bouts of depression were fueled by years of built up disappointment. This disappointment began early in life when I’d hope that my parents wouldn’t fist fight. Or I’d hope that my real father would come and whisk me away from the chaos that swirled around me. And then my hopes turned into unrealistic daydreams. I remember daydreaming that Elvis Presley would be driving down Highway 54 in Fayetteville and his car would break down. In my daydream, he would come to our little fishing cabin on the lake and ask to use the phone and then he would fall in love with my mom and take us home with him. I outgrew those daydreams but I never outgrew hoping for a better life. As I got older, I began to make my hopes much more spiritual by attaching a scripture to them. My disappointment would grow exponentially when God did not perform as I had hoped He would. As an adult, I decided that God wasn’t too concerned with what I really wanted to I would want what He wanted. And what He obviously wanted was for me to be the perfect pastor’s wife in a church in Gallup, New Mexico. If my only hope was what I thought He wanted then I’d never be disappointed again. Isn’t that the best definition of depression you’ve ever read? My heart was sick with disappointment. There came a time that along with the anti-depressants, the dietary changes, and daily exercise that I had to deal with my sick heart. I had to do some serious forgiving….. I had to forgive my mom for the chaos that swirled around my childhood. I had to forgive my biological father for only being a sperm donor. I had to forgive Hank for not giving me everything I wanted. I had to forgive God for not performing as I expected. And I had to forgive myself….. You see, I had decided that I was the common denominator for things not working out as I expected them to. I wasn’t good enough to be loved and protected by a father. I didn’t deserve the nice things in life. And even God couldn’t trust me to build His church in Gallup. I had to stop looking at everyone and everything around me and do some soul searching. It was at that time that I decided rather than focusing on being Bert’s daughter, Hank’s wife, Hannah’s mom, or the Stronghold’s pastor, that I would simply be God’s daughter. And all I would expect from Him is what I’ve seen Hank do for Hannah. If you are dealing with depression, may I suggest that you see a doctor who can help you with the medications you may need along with making the dietary changes and adding daily exercise to your life. And will you consider taking it a step farther and seek out someone who can help you deal with the heart issues? I don’t want you to have a sick heart anymore……. 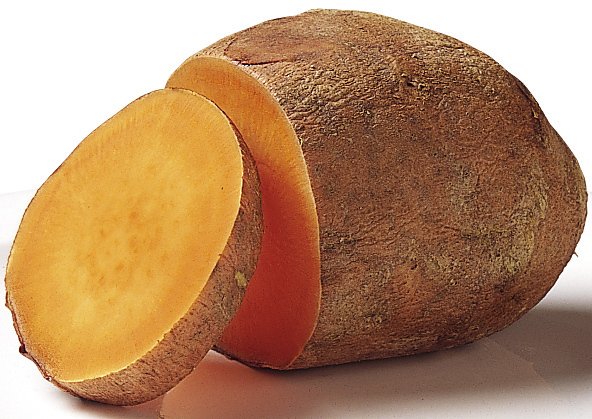 When water is boiling, add sweet potatoes. Cover & cook until tender, about 10 minutes. When potatoes are tender, drain the water and return potatoes to pot. Mash potatoes to desired consistency. Add the juice & zest of 1/1 navel orange. I served this with chicken and lima beans…..
Oh! And don’t waste the rest of that orange – serve it with the meal! Recipe borrowed from Oxygen Magazine. Doing 30 minutes or more of exercise a day for three to five days a week may significantly improve depression symptoms. But smaller amounts of physical activity — as little as 10 to 15 minutes at a time — may make a difference. It may take less time exercising to improve your mood when you do more-vigorous activities, such as running or bicycling. Get your mental health provider’s support. Talk to your doctor or other mental health provider for guidance and support. Discuss an exercise program or physical activity routine and how it fits into your overall treatment plan. Set reasonable goals. Your mission doesn’t have to be walking for an hour five days a week. Think realistically about what you may be able to do and begin gradually. Tailor your plan to your own needs and abilities rather than trying to meet unrealistic guidelines that you’re unlikely to meet. Prepare for setbacks and obstacles. Give yourself credit for every step in the right direction, no matter how small. If you skip exercise one day, that doesn’t mean you can’t maintain an exercise routine and might as well quit. Just try again the next day. Stick with it. If you exercise regularly but anxiety or depression symptoms still interfere with your daily living, see your doctor or other mental health provider. Exercise and physical activity are great ways to ease symptoms of anxiety or depression, but they aren’t a substitute for psychotherapy or medications. Flat dab in the middle of my menopause, we discovered that someone was stealing money from the men and women in our church and, as a result of that, the church began to shrink each week. It seemed as if everything that I had given my life to was dying right in front of my eyes AND I was having hot flashes along with various other symptoms of menopause. It was horrible and I was absolutely hopeless. At that time, my son-in-law who happens to be a psych-nurse suggested that I consider going back on antidepressants. Like many others, he believes that anti-depressants can be used to get you through difficult times and then you can be weaned off of them to live life. And I knew that too because I had used them in the past. And it worked for me! I believe that those little pills helped me though some of the most difficult times in my life —- But there was one area of life in which they worked against me. Not only did I gain weight while on them, I also had a difficult time losing it. And for awhile, I had to balance out which was the lesser of two evils – depression or weight gain. I can’t say that I was content with the weight gain but it was a whole lot easier to handle with those little pills. Eventually things got better for me emotionally – or maybe I just got stronger. Last fall, I followed my son-in-laws advice and began to wean myself from the anti-depressants. Not only did I lose the weight I’d gained but I I had also gained a whole new perspective on life. While I know that there are going to potholes in the road of life, I believe that I’ve learned how to navigate my way around or through them. When it seems as if life is crashing in on me, I go to the gym and workout my frustration instead of wallowing in it. I’ve learned that too much sugar works as a depressant in me and that exercise is a calorie burning antidepressant. A tired body sleeps well but a depressed mind spends the night rehearsing all that’s not working in life. I’m not telling you to wean yourself from those little pills known as antidepressants but I am telling you to start adding some exercise to your day and to begin paying attention to how your diet makes you feel emotionally. I would suggest that you google “sugar and depression” to better understand the link between diet and depression. And, as you begin to notice that life is looking better and better, talk to your doctor about making any changes in the medications you take.